This one's a nice, dignified, respectable-type Paphiopedilum. Nothing too out of the ordinary, though the petals (or are these sepals? 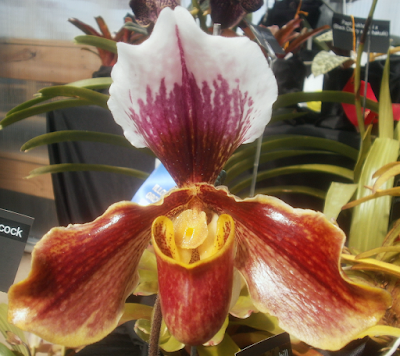 I can never remember. . . .) are maybe a little narrower than usual for a paph. Also noteworthy: Winston Churchill sure gets around, doesn't he? I got confused by this particular one, because the way the photograph lines everything up, the two non-lip petals are pointing where I would expect sepals to point. Anthurium no. 0532 "Amber Alert"
Anthurium no. 0333 "Isaiah Littleprayer"